Kohler Co., a signature Wisconsin manufacturer, is set to join the dozens of U.S. corporations buying renewable electricity to displace fossil fuel generation on the electrical grid. But the source of this clean energy is nowhere near the company’s headquarters in Kohler. The wind farm that will sell this electricity to Kohler is instead located in east central Kansas, nearly 800 miles away. A leading manufacturer of kitchen and bath products worldwide, Kohler recently entered into a 15-year contract with Enel Green Power North America to purchase electricity generated from a 300-megawatt (MW) wind power plant now under construction. Kohler’s share of Enel’s Diamond Vista wind farm is 100 MW, which will produce enough zero-emission electricity to equal the consumption of nearly 40,000 typical households. Like many other corporate wind purchases, however, the electricity bought by Kohler will not directly supply its own operations. Instead, Kohler will resell the wind generation it buys to the wholesale electric market serving the Southern Plains states. At the same time, Kohler will retain the renewable energy credits (RECs) associated with the output. These credits will be used to offset the greenhouse gas emissions from the electricity actually used to power all of the company’s U.S. and Canadian operations, including its flagship manufacturing facility in Kohler, Wisconsin, as well as its nearby golf and resort properties. This action will reduce Kohler’s global carbon footprint by 26%. This is by far the largest renewable energy purchase undertaken by a Wisconsin corporation, befitting an industry leader that has embraced a goal to become net carbon neutral by 2035. With more than 50 manufacturing locations worldwide, Kohler is on the lookout for innovative pathways that can achieve substantial greenhouse gas emissions with minimal impact on its bottom line. In addition to its environmental benefits, Kohler’s purchase will set in motion a significant economic jolt that will last throughout Diamond Vista’s operating life. Unfortunately, these economic benefits will be reaped entirely by the host communities in rural Kansas, bypassing Wisconsin altogether. The recently commissioned Quilt Block wind farm in southwest Wisconsin exemplifies the economic development potential represented by renewable generation. The largest power plant energized in Wisconsin last year, this 98 MW installation will, over its lifetime, direct millions of dollars in landowner payments and tax revenues into the coffers of both Lafayette County and the host township. At the same time, Quilt Block will supply La Crosse-based Dairyland Power Cooperative and its members with clean, affordable electricity under a long-term contract. As it happens, the developer of Quilt Block, Houston-based EDP Renewables, would like to develop additional projects near where this project was just completed. In addition, numerous solar developers are eyeing opportunities to build large-scale solar in Wisconsin. These projects could, in theory, supply local corporate or institutional customers with the renewable power they are seeking, while strengthening the local economy where the projects are built. That certainly has all the earmarks of a win-win proposition for Wisconsin. There are two models in early stages that could facilitate these win-wins for Wisconsin companies and local economies. 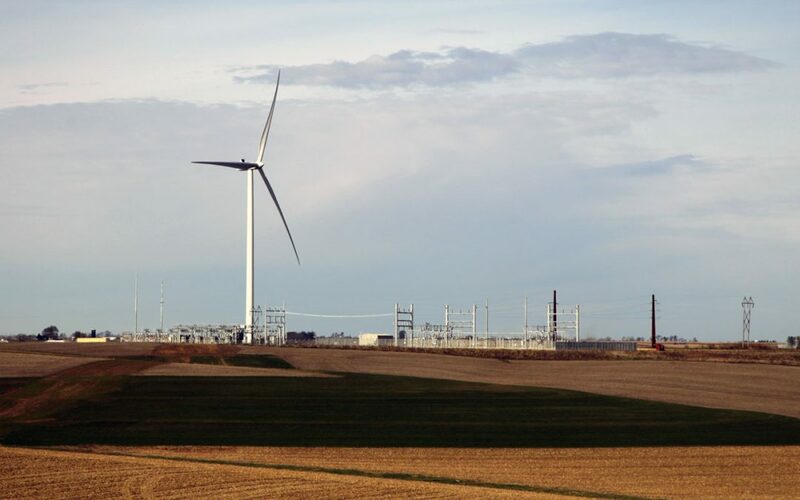 The first option is a “Corporate Renewable Energy Service,” which electric utilities can put in place to connect larger customers with low-cost renewable power generated from solar arrays or wind farms located in Wisconsin. These three-party arrangements connect the corporation (or local government), the utility, and a specific renewable energy project. The benefit to the company is a relatively seamless, and perhaps cost-neutral, arrangement that flows the energy production through on their existing utility bill. We supported Madison Gas & Electric as they pursued such a service in 2017. However, they remain the only utility explicitly offering this service in Wisconsin. We need other utilities to design and offer this type of service to enable Wisconsin-based companies to connect to home-grown renewable projects. The second model was trail-blazed by Organic Valley last year. OV, a farmer-owned food cooperative headquartered in La Farge, Wisconsin, recently agreed to purchase RECs from new solar arrays supplying power to a consortium of municipal electric utilities in southwest Wisconsin and Minnesota. This amounts once again to a three-party arrangement. Two separate agreements are needed: the utility and the renewable energy project owner reaches an agreement on energy price, while the corporation desiring renewable energy strikes an agreement with the wind/solar project developer on the price for the separate renewable energy credits. One difference is that the utility bill for the corporation is unchanged, while they have a new expense for the purchase of the RECs. Compared with Kohler’s 100 MW purchase, the 12 MW of renewable generation leveraged by the Organic Valley purchase is modest, but it could serve as a model for other state-based companies and local governments to embrace. What’s clear is that Kohler and Organic Valley are just the beginning for Wisconsin companies seeking large amounts of renewable energy. Wisconsin’s whole economy will benefit most if we can maximize the number of in-state projects to serve these Wisconsin-based companies. Now is the time for our electric utilities and large corporations to work together to facilitate in-state success stories for achieving corporate sustainability goals while building Wisconsin’s local economies. I had a great visit to Washington, DC the week of March 12th for a conference on Energy Policy hosted by the American Council on Renewable Energy (ACORE). While there, I also made time to visit Wisconsin’s congressional delegation. I was able to give our elected officials the latest information on the exciting growth of renewable energy in the last few years and the even faster growth that we expect renewables to experience in the future, especially in Wisconsin. The ACORE Policy Summit was a great opportunity for me to learn about the renewable energy issues happening in Washington and around the country. Speakers included Senators Maria Cantwell (D-Washington) and Lisa Murkowski (R-Alaska), FERC Commissioner Robert Powelson, and Department of Energy Under Secretary Mark Menezes. I also met with many trade association leaders representing renewable energy such as the Solar Energy Industries Association (SEIA) and American Wind Energy Association (AWEA) as well as corporations who are leaders in the use of renewable energy and energy efficiency such as Amazon. Among the hot topics I discussed with the congressional offices were the federal Omnibus spending bill and the significant cuts that were proposed to the Department of Energy in their renewable energy budget and funding for the Advanced Research Projects Agency-Energy (ARPA-e). (In the final Omnibus Bill deal signed by the President on March 22nd, congress not only restored the budgets of both programs, but increased them significantly!). While visiting, I also thanked the following members of the Wisconsin delegation who signed a letter encouraging the EPA to approve applications for biogas-based electricity to qualify as a renewable fuel under the Renewable Fuel Standard program: Congressmen Mark Pocan (D-2nd), Ron Kind (D-3rd), Glenn Grothman (R-6th), Sean Duffy (R-7th) and Mike Gallagher (R-8th). This “electric pathway” would greatly assist many Wisconsin farmers to continue responsibly managing their manure and preventing runoff and ground water issues while creating renewable energy. Senator Tammy Baldwin is working hard to put together a Senate version of this letter to the EPA and I would encourage everyone to contact Senator Ron Johnson and encourage him to sign onto the letter as well. Overall, it was a very productive and educational trip! The overriding theme that came out of the trip is that renewable energy is just now hitting its stride. It is going to get even less expensive, more reliable, grow faster and become an even more important component of the US and world energy mix! 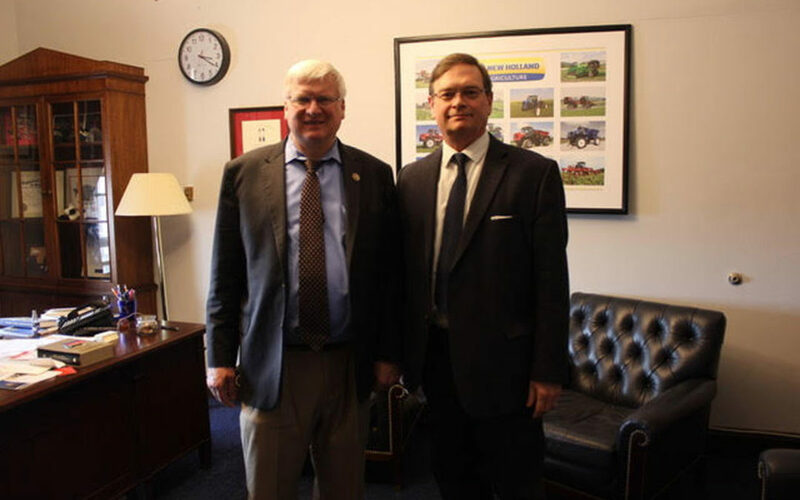 The image above shows me with Congressman Glenn Grothman following our meeting. Monday March 12, 2018, Madison. 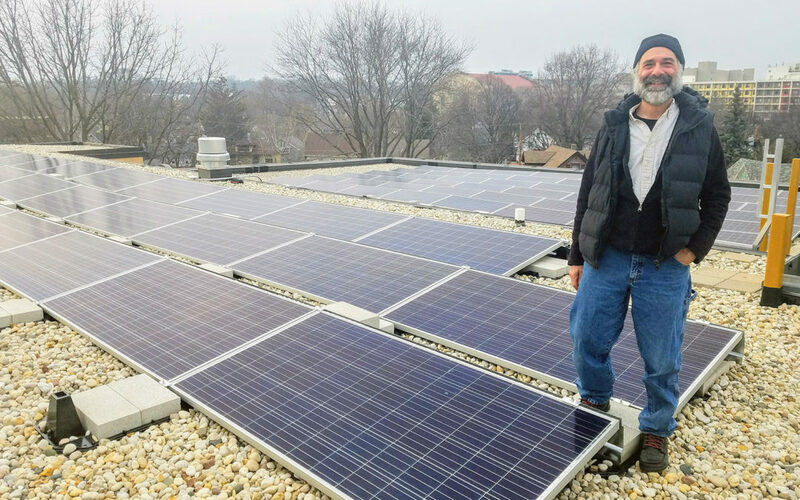 Solar for Good, an initiative from the renewable energy advocates at RENEW Wisconsin, will offer grant funding this spring to assist nonprofit organizations with installing solar panels on their facilities. The program is funded through a donation from philanthropists Cal and Laurie Couillard of Deerfield. This spring, Solar for Good will award a total of $110,000 in grants to nonprofit organizations and houses of worship to assist them in installing solar photovoltaic systems. The grant program will fund up to 20% of the cost of a solar array, with a grant cap of $10,000 for solar arrays sized less than 75 kW and a grant cap of $20,000 for arrays 75 kW and above. Solar for Good will also offer small grants for technical assistance, including professional solar site assessments and engineering services, to get projects started and see them through to success. The program plans to offer both a spring and a fall grant cycle each year and be sustained for three years or more. RENEW Wisconsin and Solar for Good aim to use the grants to help organizations going solar to spread the word about their solar investments and educate their communities about the benefits of solar. In 2017, the program offered grants to 16 nonprofit organizations across Wisconsin, including a food pantry, a shelter for homeless veterans, and several houses of worship. When all the projects are completed, the grants will have supported over $1.2 million in solar investment and added 573 kilowatts (kW) of new solar electric projects to the state. Organizations can learn more and apply HERE. In order to be eligible, the organization must be a registered nonprofit organization located in Wisconsin, be in good financial standing, be ready to install solar and agree to participate in educating community members about the benefits of solar energy. If approved for a grant, all fundraising, design and installation for the solar project must be completed within 12 months. Applications for this round of funding must be received by Monday April 9, 2018. Decisions and funding announcements will be made by Wednesday April 15, 2018. For organizations looking at solar for the first time, technical assistance grants are available to fund a solar site assessment (up to $250) or engineering review (up to $500) for their solar array. These applications will be reviewed separately from the applications for grants for solar installation and will be awarded on a first-come, first-served basis.